DYSGRAPHIA: ALL ABOUT BAD SPELLING. This is an extension of a yesterday’s EFTI post in which I talked about my personal struggle with dysgraphia. I promised parents a bit more today. Not if you have dysgraphia. Moreover, that is what makes this little known learning disability hurt so much. The sufferer only knows when criticized and or his or her brain decides to show the error. Although teachers and employers are required by law to make “reasonable accommodations” for individuals with learning disabilities, they may not be aware of how to help. Speak to them about dysgraphia and explain the challenges faced as a result of this learning disability. For more on dysgraphia, check out these 10 dysgraphia resources. All children want to do well in what matters to the adults in their world. That means all children are motivated to succeed in school. Just look at the kids lined up to go to kindergarten or the first grade and 99% of them will have happy faces. Fast forward and with every year more and more kids will not be eager. Easy to understand. Why because hope is dying and school is becoming more and more painful. When it comes to children, all try lots longer than cats to figure out how to avoid pain. The younger the child, the more s/he will keep trying to figure out how to please adults. Hope of good results is part of the young child’s make up. But in time what the expert calls “Learned Helplessness” set in. In addition to dsygraphia, I suffer from dyscalculia. That means trouble with math. That is where learned helplessness has its hold on me. I don’t do any math. I’d rather trust the bank’s accounting than mine. No way I can balance books and even calculators do not help. Nine times out of ten, I punch in the wrong numbers. Hate when I have to punch in a telephone number or any other number beyond four digits. Four I can manage. Anyway onward with dysgraphia. I am less hopeless about my dysgraphia. Probably for a number of reasons. One, for as long as I can remember I wanted to be a writer. My father was a newspaper reporter and also published his own weekly newspaper. I adored him and that meant I wanted to do what he did. Then as explained previously, many teachers saw not the mistakes but my content which was apparently in their eyes was worthier than many others students. Also testing was not so mandatory. I had a mother who pushed trying and worried less about success or mistakes. The computer’s spell and grammar check made becoming a writer possible. I do not have dyslexia and I loved to read and am a fast reader. As the pundits about writing say, if you want to write: “Read, read, read, and read some more.” I still read two or three books a week in addition to all the reading I do on-line. Finally, my life as a foster parent and therapist caught the eye of sales minded editors. I had something to say from a unique position. Lucky me and luck does play a part in all successes. Learned Helplessness did not rule me in terms of writing as it did with my math problems. Read this carefully: Once a child decides nothing s/he can do will get good grades or compliments or even an internal “I got it right” message, the desire to keep trying decays and eventually dies. The harder it is for the child to do what is asked, the more quickly the will to try fades. Then all sorts of diversionary strategies take over: withdrawal, clowning, running away, drawing negative attention to yourself, and aggressiveness are among the most common. Jerome Kagan, human behavior guru sees the above strategies as ways to deal with the pain of uncertainty or not knowing and hence not feeling in control of yourself or the world. He believes this almost as painful as unmet survival needs. In my work with children, I saw three stages to reaching the decision that nothing you could do made a difference in meeting yours, another’s, or life’s demands. Stage one: Hoping and trying. Thinking as the pundits say, if you keep trying you will get there. 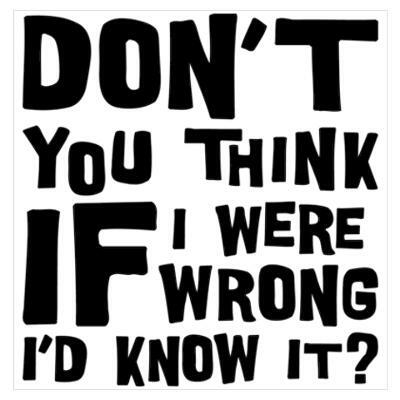 Stage two: Doubting you can “just do it” but still a bit hopeful but doubt and feelings of shame start to intrude. Trying becomes more and more painful if success is not part of the mix. Stage three: Absolutely certain you will not succeed. Despair and anger set in as well as the need to defend yourself from the pain of failure. That leads to the strategies listed above. This struggle with meeting societal or parental demands takes many forms. I first spotted it when dealing with Good Kids Doing Bad Things. Then the struggle was between being a good kid and a bad kid. I think at least one of the kids engineering the Columbine killings had decided he was all bad, so doing the worse he could do became possible. We all face that struggle for we all have thoughts and desires that lead to bad as well as god behavior. Many of us gravitate toward religion to help us stay on what our hearts know is the right track. Most of us succeed, but when we hear about a fallen priest, preacher or rabbi, I think, s/he was trying to be good, but needed more help. Back to tips about learning disabilities. Parenting tip one: When a child begins avoiding school or homework with any strategy described above, worry. Worry, but take the time to see if the problem is consistent and is eroding both school efforts and peace in the home. parenting tip two: While taking the time to do the above, learn a bit about learning disabilities in general. Parenting tip three: If the signs of a disorder last consistently for six weeks, talk to some experts. Make your child’s teacher one; make a trusted physician another, find some parent who have been there and done that. All will probably have different views. Parenting tip four: Be prepared for disagreement and easy assurances all is right particular when talking to relatives and friends about your worries but also from the professional. Often such assurances are valid, but also often they reflect the human need to be kind. Parenting tip five: Get the child’s view of what is going on. As children often think they are to blame for all and every problem in the world. This makes it hard for them to share openly about concerns, so go slow. In fact, a child or a teen make talk more openly with someone besides a parent. An aunt or uncle might be an ally in your quest to learn what the child is feeling. Don’t forget youth leaders, advocates, or similar folk. Parenting tip six: Think of finding a good therapist or other source of support for you and the child. Start with you and think carefully about what a good therapist means. I think it means someone with knowledge I do not possess, who can relate to me and my needs, sets a clear contract using SMART goals, measures outcomes and is not doctrinaire but has a wide variety of tools to help at his or her command. Parent advocates were mentioned earlier as were youth advocates. These can be extremely helpful, but also not helpful. Parenting tip seven: Related to finding helpers that help. You must be your own and your child’s best advocate. That means two things. Experimenting and keeping tabs on what is working and what isn’t working. 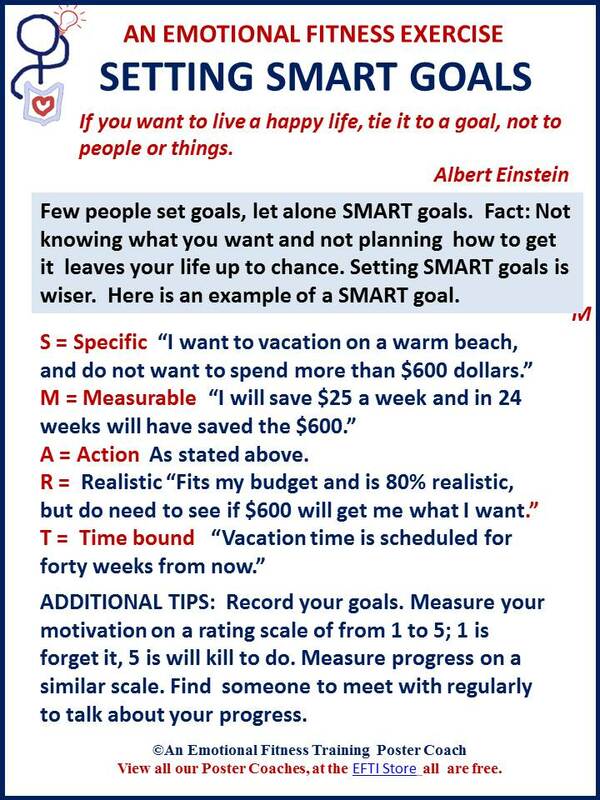 Setting some SMART Goals is the way to do this . Parenting tip eight: Be patient. Nothing is going to happen quickly and that is okay. Children are resilient and usually move forward with their lives despite problems. That does not rule out trying to help, good help always helps and improves things better and faster than no help. Parenting tip nine: Remember the five to one rule; five good experiences as a balancing force for every bad experience. With my own sons, I refused to get them tutoring over the summer. Almost got me reported for educational neglect, However, the only time each son was truly happy was when school was out and I could not bear taking that away from them. This also means making the most of what the kids do well and want to do. Parenting tip ten: Strengthen yours and your child’s self-soothing skills. If you like this post share it with another. That is practicing deliberate kindness which is an easy Emotional Fitness Exercise . Word Press Aug 11, 2014 Daily Prompt New Wrinkles: You wake up one day and realize you’re ten years older than you were the previous night. Beyond the initial shock, how does this development change your life plans? How does this fit in with todays Parents Are People Too blog. In ten years the worries of today will be old hat. For many parents age and stage bring their own rewards and challenges. Maybe you wake up having missed the perils of a disgruntled teens or in time to enjoy a wedding or to find you have some wonderful grandchildren. When it comes for to the future, plan for what you can and then hope for the best. This entry was posted in Parenting Issues, Special Kids/Parents and tagged Challenged Children, challenging children, Dysgraphia, Emotional fitness, Emotional Fitness Training, Emotional Health, emotional intelligence, foster parents, help for parents, how to parent, Katherine Gordy Levine, Learning disablities, parenting, Parenting advice, Parents Are People Too, postaday. Bookmark the permalink.